Log Cabin Lunacy!!! I found the above quilt, courtesy of Yahoo images. Isn't it so pretty??? I continue to love the versatility of this block, and the lovely quilts that are being created. I try really hard to find out who made each quilt, but could not find out who made this one...but I salute your creativity, dear quilter! This is the gift from me, for this week. So please link up below, and show us what you have been up to, Log Cabin Loonies!!! Our winner from last week is Alycia, from Colorado. I will send an email to you, and please send me your snail mail address. So sorry for your bad day of work...hopefully there won't be more like that! When I hear about things like that I am so glad to be retired from nursing. Your quilt is beautiful! I've never seen that layout before, and I really like it! Hope your next duty day will be lots better! ---"Love"
One of these days I hope to pull out my quarter cabins and join your band, but for now, other things take precedence and they'll have to wait. Your nursing notes touched my heart. I'm so sorry for your difficult day, Julie. My daughter is an ICU nurse and sometimes comes home battered, bruised, and abused. My husband and I wonder if nurses sometimes deal with PTSD from all they see and deal with. Blessings to you for your nursing care to your patients. That quilt you showed at the beginning of the post is gorgeous!!! So sorry for your awful day of work. I changed from an ACU unit to an outpatient day procedure unit recently, partly because of that type of thing. It is just too hard anymore to deal with that! My new unit is very busy, but doable once I get the work flow down. I remember my dad waking up from a long and difficult surgery in ICU and was confused and obnoxious. It was horrible to witness- he told the nurse he was going to call the police on her if she didn't let him get up and go home. I was also so thankful he wasn't a person that cursed, cause I'm sure he would have been saying a lot worse things. It was pretty traumatic for me to see him with ICU psychosis. I can't imagine seeing that on a regular basis. I'm happy you have the day off! Love that version of a log cabin! I *covet* that log cabin. Covet. I have a lot of pale greens in my stash. That would be the neutral. Thinking about the other pieces. Oh, what lovely thoughts here at work on a day where my system died and I'm trying to get pay out. Hope you don't have to repeat a day like that either. Bless you. What an unusual log cabin quilt. Looks like quarter logs. I like it. I like unusual! 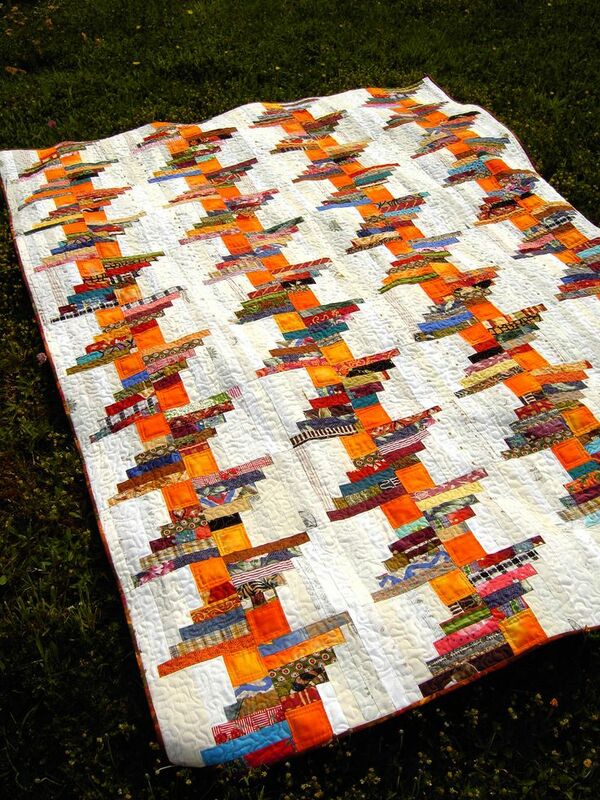 LOVE that log cabin quilt you posted..everything about it! Bless you for your wonderful nursing. I had some difficult, unruly, mean patients during my nursing time but never experienced being struck by a pt. I probably wouldn't have taken it as well as you. Sounds like you need a few days off!! Hopefully your days will be smoother for a while! That is the most unusual Log Cabin setting I have ever seen. I must remember it. Sorry you had an uncooperative patient and that subsequent days will be better. Great log cabin setting. It's quite striking.... lovely. I was a nurse for 32 years & now retired by disability... Too many concrete floors, big bed moving, too many heavy surgical patients, etc.... Nursing Is a very difficult job. I'm sorry you had a confused patient, they are so hard to deal with. I hope things have improved. Sometimes I sang to patients like that, even children, a song from their era. It usually worked. Sometimes Amazing Grace....that helped me! I don't think I've seen this setting before. It is quite striking and works especially well with the large center squares. So sorry you had a terrible experience like that. It's just awful but my hospital has had an increase in abusive episodes towards staff and had to hire 2 security guards just for the ER! I think quick sedation (if safe) is the only way to deal with these nasty characters as they have no respect and do not respond to any of the usual crisis interventions.